In life, one has to take a break from the routine of your day to day lives. You need some ample time to relax and rejuvenate yourself. To regain your spark to function correctly. What better way to do this than to take a vacation! And what better place to visit than Key West. Brace yourself for I have this super crazy deal I want to hook you up. The ultimate jet ski tour of key west is an adventure you cannot afford to miss out. The experience is an opportunity to Experience Key West from the sea on this ultimate island adventure. This tour is giving you an opportunity to glide along the waterways in Key West and a couple of nearby islands in this tour while you are accompanied by your professional guide. This adventure takes you across the Atlantic Ocean or the Gulf of Mexico. To spice things up, it can even make you to both places if time allows. This is a 26-mile jet ski tour adventure that will have you fall in love with the sea life as you enjoy plenty of freestyle riding on your way. 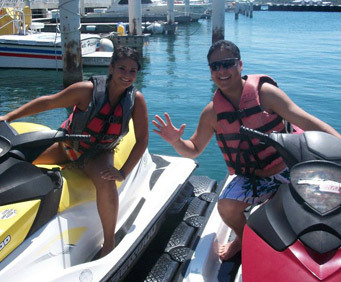 You can even take photos on this fantastic jet ski tour that help you hold on to the memories you will have created. Just ensure that you carry a waterproof camera! There are a variety of wildlife sea creatures on this tour. The more reason you have to carry your camera to take the photos. This tour will also give you an opportunity to admire the most photographed site in Key West. And I can guarantee you; the site will leave you dazzled. This jet ski tour is an adventure you want to be part. Only book your reservations and be assured to have the most exhilarating experience in this jet ski tour. Experience Key West from the sea on this ultimate island adventure! Glide along tropical waterways around Key West and several nearby islands with your professional guide. This 26-mile Jet Ski tour will take you through the Atlantic Ocean or the Gulf of Mexico, or both! Go on a 26-mile Jet Ski adventure in Key West! Follow your expert guide along the water of the Atlantic Ocean or Gulf of Mexico, and enjoy plenty of 'freestyle riding' along the way. Be sure to bring a waterproof camera because you may be able to see a variety of wildlife, such as dolphins, stingrays, sea turtles, or manatees. Admire the southernmost point in the continental United States (the most photographed site in Key West), a WWII submarine base, mangrove islands and many other sites on your Jet Ski tour.